The Pear shape diamond, as the name suggests, is just like the fruit with a rounded end and a tapering end. Really the shape is more in keeping with a tear drop, which is actually a better description of the shape. The pear shape diamond is both elegant and beautiful. 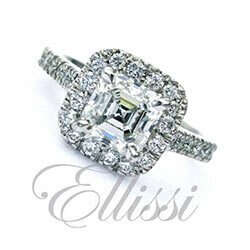 With this diamond as a centrepiece we are able to create some of the most stunning designs. The pear shape really lends itself to very original and unique designs. They work well as a central feature and also as the side diamonds in a three stone ring, when you have a matching pair. Ring designs using a pear shape diamond will usually need to have the pointy end of the gemstone protected, as it is sharp and susceptible to being knocked and damaged. If the ring design is a halo setting, this does protect the pointy end to some extent. We can in this case use a four claw setting and leave the point exposed. If the ring design is a solitaire or a design with diamonds in the shoulders, we need to cover the pointy end with a setting. This can be what is called a “V cap” setting, which is like a rim of gold covering the pointy end and a little of the side of the diamond. Or we can make an inverted pear claw setting, also known as a “tiger claw” setting. I especially like the Halo / Cluster Design Rings for this diamond type, because these designs allow for a great combination of security of the diamond in the setting, and also the opportunity to expose as much of the diamond as possible. If you see less setting, you see more diamond. For more information on the things we look out for when choosing a pear shape diamond, click on this link: Selecting a Pear Cut Diamond. “Anastasia” Pear shape diamond halo design ring. Side view of “Myrtle”, a three stone diamond ring. “Myrtle” side view of cushion and pear cut ring. “Theodora” Pear shaped diamond in a diamond set band. “Justina” Pear shaped solitaire ring. 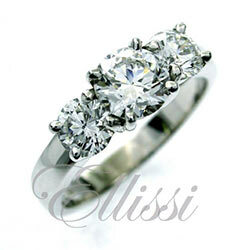 “Jillian” unusual design pear shape diamond ring.